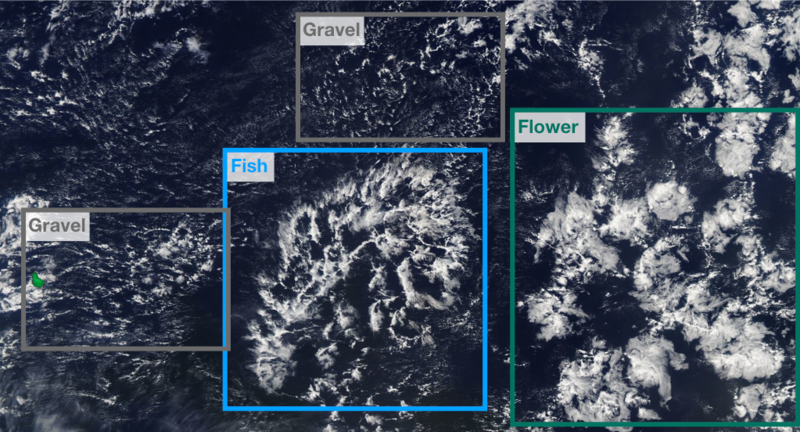 Cloud pattern classification example in „gravel, fish, and flower“. 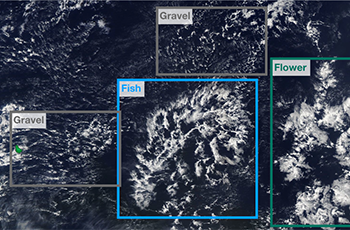 Imagery from NASA Worldview. A new study, published in Nature by German scientists from Jena and Hamburg, with lead author Prof. Markus Reichstein, managing director at the Max Planck Institute for Biogeochemistry (MPI-BGC) and co-author Prof. Bjorn Stevens, director and head of the department “The Atmosphere in the Earth System” at the Max Planck Institute for Meteorology (MPI-M), shows that artificial intelligence (AI) can help to better understand climate and the Earth system. The scientists show that specifically deep learning has thus far only partially exhausted its potential for understanding the Earth system. In particular, complex dynamic processes such as hurricanes, fire propagation, and vegetation dynamics can be better described with the help of AI. As a result, climate and Earth system models will be improved, with novel hybrid models combining artificial intelligence and physical modelling playing an important role. The scientists contend that detection and early warning of extreme events as well as seasonal and long-term prediction and projection of weather and climate will strongly benefit from the discussed deep-learning and hybrid modelling approaches. “There is truly no shortage of geospatial data but so far we've been lagging behind in analysis and interpretation,” explains Markus Reichstein. Extreme events such as fire spreads or hurricanes are very complex processes influenced by local conditions but also by their temporal and spatial context. This also applies to atmospheric and ocean transport, soil movement and vegetation dynamics, the classic topics of Earth system science. However, deep learning approaches are difficult. All data-driven and statistical approaches do not guarantee physical consistency per se, are highly dependent on data quality, and have difficulty extrapolating. Besides, the requirement for data processing and storage capacity is very high. The publication discusses strategies for linking machine learning and physical modelling. Bringing together physical modelling and machine learning results in so-called hybrid models. These can for example be used for modeling the motion of ocean water to predict sea surface temperature. While the temperatures are modelled physically the ocean water movement is represented by a machine learning approach. “The idea is to combine the best of two worlds –, the consistency of physical models with the versatility of machine learning, – to obtain greatly improved models,” further explains Markus Reichstein. Hauke Schulz, a PhD candidate working with Prof. Stevens has been leading efforts in the Atmosphere Department to use machine learning for cloud structure detection. “Machine Learning is opening new doors in the field of climate science”, he says, and points out how, as part of his research, he “profits from algorithms developed to identify objects in images for face recognition or self-driving cars and transfers them to instead detect cloud structures in satellite images. Just like the automatic detection of faces on social media images, I or rather the computer, gives cloud patterns a name. Combined with auxiliary data this allows us to study the mechanisms leading to different cloud patterns which should help us predict their distribution in a future climate. Without machine learning, it would be hard to imagine how to go about answering the questions we have set for ourselves." Reichstein, M., G. Camps-Valls, B. Stevens, M. Jung, J. Denzler, N. Carvalhais, Prabhat (2019) Deep learning and process understanding for data-driven Earth system science. Nature 566, 195-204. doi: 10.1038/s41586-019-0912-1.